You thought taking a trip to Venice to attend this years Carnival would be a good way to spend your vacation. Little did you know that on your last night in the city, an innocent conversation in a local bar would have dire consequences. The proprietor himself would end up poisoning you and withholding the antidote unless you agreed to embark on a mysterious journey to find a precious jewel. Corto Maltese: Secrets of Venice, from French developer Kids Up Hill and publisher Bulkypix Games, takes you on a mystery roller coaster ride through the streets of Venice. In this point-and-click puzzle-solving adventure, you are tasked with solving puzzles in order to make it closer to completing your task and saving your life. Along the canals of Venice, you will dodge bullets, skirt explosions and may even open the doors to ultimate knowledge. Corto Maltese likes his Mai Tai blended, not shaken. At this point, you are probably wondering who, exactly, Corto Maltese is. Maltese is the brainchild of Italian comic book creator Hugo Pratt (June 15, 1927 – August 20, 1995), who was known for creating comics with strong storytelling featuring fictional characters in historically accurate settings. The Corto Maltese comic book series was about the titular character, a motley sailor-adventurer, and his adventures with smugglers and pirates in the World War I–era Pacific Islands. The character of Corto Maltese is a pithy sea captain adventuring during the early 20th century (1900-1920s) and is described as a “rogue with a heart of gold” who is tolerant of the intolerable and sympathetic to the underdog. Sort of a James Bond type of the South Pacific. In Corto Maltese: Secrets of Venice, you must follow in the footsteps of Corto, traveling through time and space to discover a fabulous emerald; the Key of Solomon. This is the compass. Dialing in codes that you find in the environment and in the gazette will either net you with a puzzle to solve or the means to solve a puzzle. Both usually end up with you being rewarded with some type of object for your troubles. Through a series of puzzles and riddles, real or hallucinated, you must make your way through Venice in search of the Key of Solomon. On your journey, you will need to find the ingredients needed to counteract the poison coursing through your veins as well as finding clues to discover the true identity of a secret sect that will stop at nothing to obtain the key. With the help of a mysterious compass and a gazette full of stories and hints to help you throughout the adventure, you will definitely have your hands full. The compass is the key to discovering puzzles in the world of Corto Maltese as well as providing you with the tools to solve those puzzles. The gazette will give you historical accounts of the people and places that your journey will take you to as well as showing you specific events in the life of Corto that may have had some impact on your current predicament. This is the gazette. It will contain bits of information that you are presented with once you have hit certain check points. The codes in the upper right of the gazette need to be entered into the compass to obtain a puzzle to continue in the story. The One Star code can usually be solved by using your noodle. The Two Star code will require the help of a good search engine to find the answer. 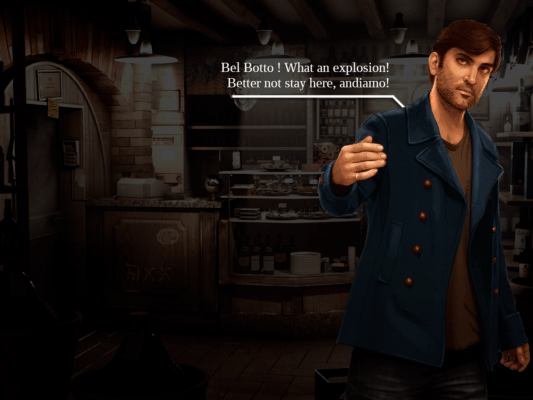 Corto Maltese: Secrets of Venice takes a unique approach in regards to the types of visuals that the game presents to the player. Instead of just sticking with one unified art style throughout the whole game, Kids Up Hill decided to create a more interesting atmosphere by presenting three different art styles to tell their tale. The game combines gorgeous artworks of actual locations in and around the city of Venice, cut-scenes using the brilliant photographic work of Marco d’Anna and actual black and white comic strips, animated of course, from Pratt’s own Corto Maltese comic book adventures. It all comes together to present a visual style that never gets boring and stays engaging over the length of the game. 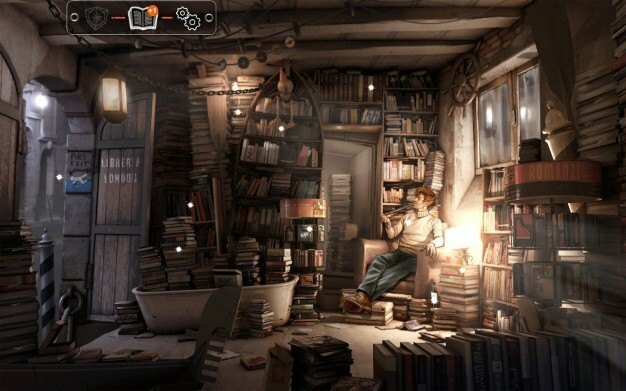 It’s a refreshing take on the visuals in a video game that incorporates painted, photographic and digital arts to tell a story while defining the environment in which the game takes place. This is the art style that you will see for all of the parts of the game where you have to interact with the environment. All of the flashing stars are points that you need to investigate for clues and ingredients for the antidote. The soundtrack and sound effects in the game really help to set the mood in this noir thriller inspired adventure. There are no voice overs whatsoever as the dialogue and narration is given to the player through text boxes and the gazette that you obtain early on. The music, however, is masterfully composed and is the perfect accompaniment to the dark twists that the game will take. The sound effects are equally effective in setting the mood and helps to bring the city of Venice to life. While it would have been nice to have voice overs for some of the many interesting characters that you will meet, it wasn’t a deal breaker because they were missing. I have to say that the best part of Corto Maltese: Secrets of Venice are indeed the many puzzles that the game presents as its main idea. 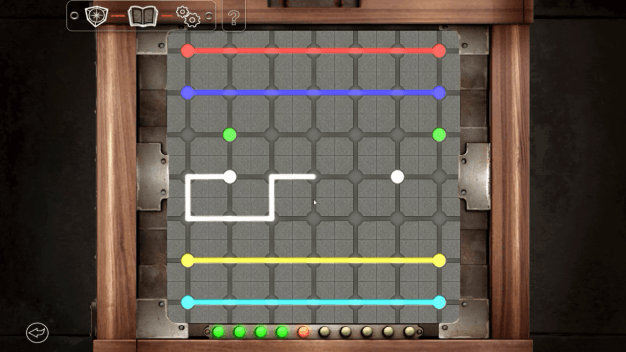 You can choose on the fly the level of difficulty of the puzzle that you need to solve in order to proceed in the game. The first level of puzzle difficulty may take some thinking but it can usually be solved without going to an outside source. The second level of puzzle difficulty is much more difficult and will require you to Google search a few topics in order to discover the solution. I found myself first examining both puzzles to see what they required to solve them and then choosing the one that was the most interesting. This is a simple puzzle that you will see early on in the game. Puzzles found later in the game are much more challenging but still remain fun. 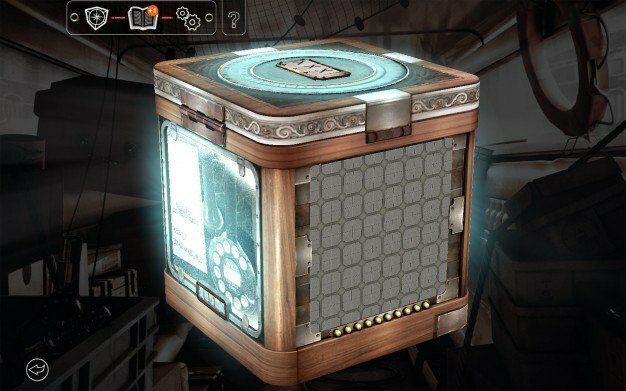 While the puzzles are a highlight and offered an appropriate level of challenge, the gazette fell somewhat flat as a tool for presenting background information for the events in the particular chapters of the story as well as for presenting clues to help in the solving of puzzles. Many of the bits of information that the gazette is filled with had terrible English translations and I had a hard time trying to glean what exactly it was that the information was trying to impart to me. Because of this, it was especially difficult to understand what was going on in the story as far as why the main character is in Venice, what connection he has with Corto Maltese and what Corto Maltese’s connection is with the secret sect trying to recover the Key of Solomon, to name a few. There were only a few translation mistakes in the dialogue, and for the most part it was easy to understand. I just found it strange that the same amount of care that was given to the dialogue wasn’t given to the gazette as it is such an integral tool needed to understand the underlying story and motivations for your quest. This is your guide around the city of Venice. He has a lot of connections and you probably wouldn’t be able to complete your mission without him. Overall, my time in Venice was quite thrilling and I was pleasantly surprised that developers Kids Up Hill were able to take such an iconic Hugo Pratt character and bring him to life in an all new tale for the first time in a video game. The puzzles are fantastic with just the right amount of difficulty to give your brain a proper workout. 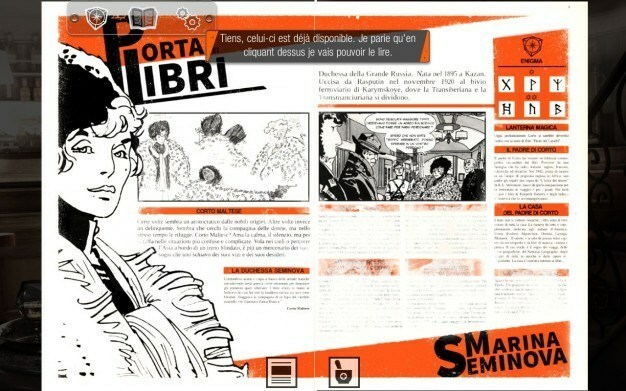 Corto Maltese: Secrets of Venice is currently available in the iTunes Store for $9.99. Giving this game a try in spite of its shortcomings is something that I recommend to those who love puzzle and riddle games. 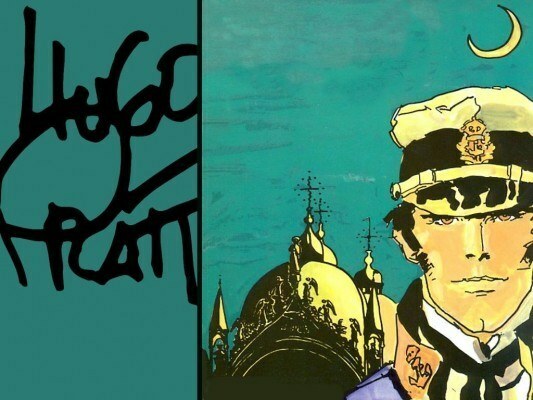 Fans of Hugo Pratt the world over will find the game to be a very special tribute to a man that created such an endearing an everlasting character.